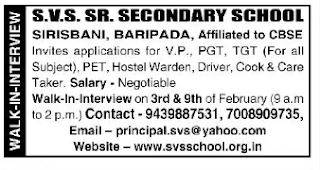 S.V.S SR.Secondary School,Baripada has advertised for the recruitment of Teaching Faculty- Vice Principal,PGT,TGT jobs vacancies. Interested and eligible job aspirants are requested to walk-in 3rd and 9th February 2019 immediately.Check out further more details below. About School: This institution named as SWAMI VIVEKANANDA SHIKSHASHRAM and this baby institution came in to being in April 2002 in its own site measuring A12.18 Dcml. of land about 4 km. away from BARIPADA, the district head quarter of Mayurbhanj in the state of Odisha. In 2005 the Govt. of Odisha had pleased to grant N.O.C. in favour of S.V.S. In April 2006 the Central Board of Secondary Education Delhi, has pleased to grant affiliation to S.V.S. up to secondary level. S.V.S. having facility of Co-education system, for its Day Boarders & Boarders.